nyc atelier is a workshop established to note the characteristics of the metropolis, especially with regard to culture, design, and the arts. The new edition of the NYCAtelier Map and Guide to Greenwich Village and SoHo has been released, and can be reached from the nycatelier home page. This new map and guide is a great way to create custom walking tours of the area. By selecting one of many different special interests the custom map engages the viewer by locating important points of interest as well as suggested walking routes and informational text regarding each location. The map series is also geared to be printed, and thus taken with the user as a map and guide to the area, custom tailored to that persons interest. 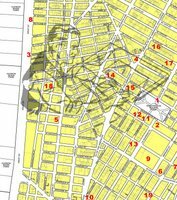 The NYCAtelier Greenwich Village and SoHo map project strives to provide the most comprehensive printable maps and guides to Greenwich Village and Soho. The maps are tailored to a variety of interest areas including art, architecture, and literary works, and can serve as the basis for several self guided tours. The maps and guides are designed to be printed or can be viewed on portable devices such as the iphone.